Strange tidings are coming from a white stucco house in Albuquerque’s Nob Hill neighborhood. It may look like any other home on the block, but hidden inside is a recording studio and a band you probably haven’t heard of. If you hold your breath, you may hear the sound of a guitar intertwining with the brush of a roadrunner’s wings and the steady hammer of a woodpecker on a dead tree branch. The couple’s vision of life in the state departs from images of turquoise and hot-air balloons. The songs on Wilderness, their newly released 13th album, are all about critters, from the flies buzzing above General Custer’s body to an octopus living in a sea cave. These are stories of wonder, of how songwriter Stephen Foster was like a wildebeest that had lost its herd, and how eels follow paths hidden from human understanding. The inspiring event that triggered the album took place very close to home. “Witnessing a sphinx-moth larva trying to wriggle its way into the hard, dry ground of my back yard one night definitely inspired me to think more fully on all the different kinds of lives little creatures were living all around me,” says Rennie. Wilderness is more than an album. 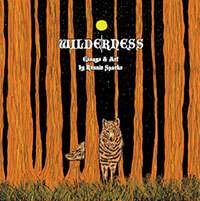 Rennie wrote a book of essays accompanied by her own illustrations, also titled Wilderness. The two thematically entangled works go together, playing off each other. The set expands the Handsome Family’s universe of creatures into a complete microcosm in which wolves watch through windows in the night and misguided ants march in death spirals. Taken as a whole, Wilderness is a work that pries listeners and readers out of their safe world of walls and beckons them into a wider world filled with the terrible and beautiful wonders of nature. The Handsome Family primarily makes their living by touring in Europe, where the band is much better known than on their own soil. They do play occasional New Mexico gigs, giving local fans a chance to ascend into Rennie and Brett’s firmament of singing frogs and alarmed prairie dogs carving tunnels through Albuquerque parking lots. Browse their tour dates and catalog at handsomefamily.com.